Is Uber Keeping Riders Safe? It’s the trendiest way to get around town, but Uber drivers have been linked to several alarming incidents including the death of a six year-old girl last New Year’s Eve. Now, the NBC Bay Area Investigative Unit has found that Uber’s policies can leave drivers and passengers in the lurch if there are accidents. And despite administering background checks, Uber still employs drivers with criminal records that include burglary, domestic assault and drug trafficking. Drivers for UberX, which unlike the more upscale Uber black car service allows regular folks to drive their own cars, say the hiring process is quite simple. “It's all over the internet,” said Driver Bassim Elbatniji. “You only add your name, you add your social security”. Elbatniji had been an UberX driver for only nine days when he collided with another vehicle. Just a mile into a short drive from the Mission to the Marina Districts, Elbatniji’s 2008 Toyota Prius smashed into another car, badly inuring himself and his passenger, Jason Herrera. “All I remember was waking up inside the actual ambulance,” said Herrera. Both Hererra and Elbatniji were left with hospital bills. Elbatniji had personal car insurance—not commercial—and his plan wouldn’t cover the accident. Uber claims it’s not their responsibility. NBC Bay discovered just yesterday that the driver of the other car in this incident is a relative of an employee at the station. 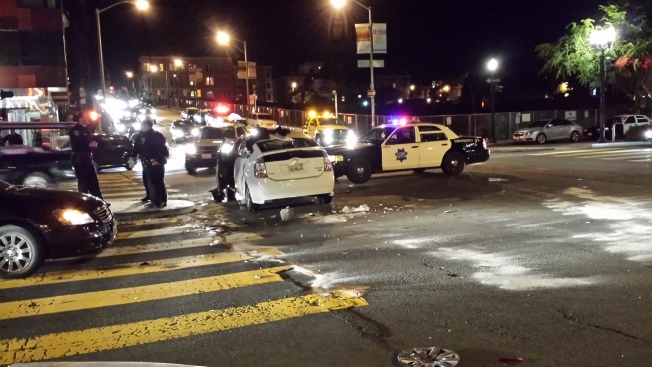 Uber X driver Bassim Elbatniji’s totaled 2008 Toyota white Prius at the intersection of Octavia Street and Oak Street in San Francisco on September 25, 2013. Kasselman did not clarify why the company is not providing coverage in the accident involving Elbatniji and Herrera. And so UberX drivers continue to operate under the assumption they are insured, while passengers could potentially pay a price beyond the fare charged if they are involved in an accident with an Uber approved driver. The Investigative Unit found several cases of UberX drivers with criminal records. In November, a passenger claimed that UberX driver Daveea Whitmire was verbally abusive. He posted this video online showing confrontation with Whitmore. Court records show that Whitmire has a significant criminal history including drug-related arrests dating back to 2005. He’s served time in state prison and jail and has multiple restraining orders related to domestic violence and selling drugs to underage girls. InvestigativeRisky Ride: Who's Behind the Wheel of Uber Cars? The Investigative Unit was unable to reach Whitmire for comment. Even though many of Whitmire's offenses occurred within the last seven years and he was on probation for a drug charge at the time he applied to be an UberX driver, Uber told us the ride service ran a background check and Whitmire had a clean record. Kasselman confirmed to the Investigative Unit that Whitmire was a partner on the Uber platform from October 2013 through December 2013. “Whitmire had a clean background check when he became an Uber partner in October. Uber maintains a zero tolerance policy for any alcohol and drug-related offenses on any background check with any partner nationwide, unlike, for example, the taxi industry in San Francisco, which permits drivers with DUIs and drug offenses,” said Kasselman. There are more cases like Whitmire across the nation. In Chicago, police found that an UberX driver was without a valid license when they pulled him over with a passenger in the backseat. Also in Chicago, Tadeausz Szczechowicz[pdf] was driving for UberX despite five prior arrests and two burglary convictions. In addition, UberX driver Jigneshkumar Patel was recently arrested for battery served a restraining order and hit with a civil suit - after a passenger accused him of sexual assault. He says the accusations are “rubbish.” But The Investigative Unit found Patel should have never been hired by Uber in the first place under their policy because of a 2012 DUI conviction. In Los Angeles, NBC asked Beverly Locke to apply online to further test the system. The reformed ex-con has a 20-year rap sheet that includes burglary, cocaine possession and current probation restrictions. But four weeks later, she did. “I was kind of baffled, still am baffled, how they let me in,” she admitted. And all indications are that Uber has fired or suspended drivers when things go wrong. But publicly, Uber’s stance is that it is a technology company, not a transportation company. In an email, Uber told the Investigative Unit that drivers are just “licensees of our software.” To Uber, the rules are different. The California Public Utilities Commission now requires that ride services like Uber carry commercial liability insurance worth at least $1 million and must conduct criminal background checks and vehicle inspections. To help cover these costs, Uber announced just last week that it’s charging a $1 “Safe Rides” fee to all UberX riders.